Creating a bar from beans is no mean feat. There is the sourcing and the checking and the process of elimination and then monitoring growing conditions and staff conditions and ensuring everyone is being paid properly and that children aren’t being exploited. It’s a full time job to do just that and then there are the beans themselves. Fermentation and drying are key processes but also getting the roasting right is crucial. Creating chocolate from bean to bar as a small manufacturer is even more fraught with potential disaster as batches that arrive are only pure at the seeming whim of chance. 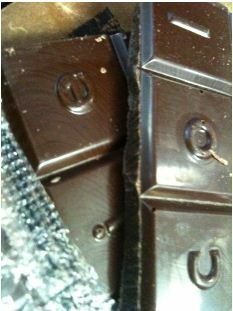 For Askinosie, they seem to get everything right as they consistently produce amazing chocolate. Without adding vanilla as others do to hide a musty smell/taste of mould in beans and without shelf-life extending and stabilising additives that others add, Askinosie create delicious chocolate that brings out something of the country of origin of the beans. With Honduras, a million images come to mind and yet the initial taste I got was not what I expected with an explosion of dried red berries and acidity fighting with the leather I got. No tobacco for me in this bar but lots of that pucker-inducing acid that makes your cheeks tingle and makes you think of a sour lemon (without the citrus). The red berry flavour really assaults your taste buds and goes white water rafting through your mouth, ensuring its aggressive flavour is almost the only thing you taste. The middle of the melt with deep chocolate notes hides an almost pure nib flavour that is fighting to get through – that woody herbal flavour that screams cocoa nib. That you get at the end after the long fudgy finish has completed its lingering vacation on your tongue. Then as that fades you get the distinctive flavour of raw nibs just hinting at the origins of the beans.